The Family of 4 Garden is slowing down a bit, since we pulled all the zucchini last week. This week all we got were cucumbers. There are still a couple pepper and tomato plants, but they are pretty wimpy. The plan is to plant a bunch of lettuce next week. 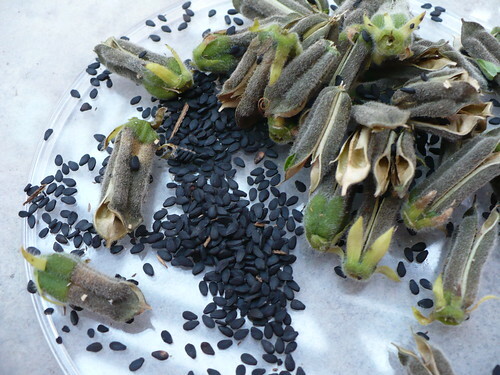 Thanks to the sharp eyes of one of the Master Gardeners, we also found a few pods from the Black Sesame plants that were ready to pick. The Black Sesame plants have been some of the most impressive in the garden this summer. The heat really hasn’t seemed to phase them a bit. Even if the harvest turns out to be negligible (although I think the yield looks pretty good considering the number of pods we harvested), they are attractive, quick growing plants that could make a really nice back border plant or screen plant in a flower bed. Posted on August 21, 2012, in Family of 4 Garden, Harvesting & Eating and tagged cucumbers, familyof4garden, sesame. Bookmark the permalink. Leave a comment.